Clinic Synopsis: The contemporary jazz drummer is responsible for a lot more than keeping time. 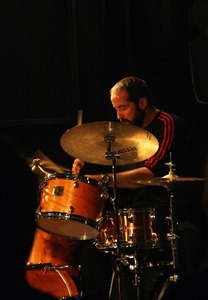 Jazz drumming has evolved in many areas. This presentation will provide basic fundamentals about jazz drumming for young drummers and band directors, including tools and practice tips to improve time feel, rhythmic subdivision, dynamic awareness, sight reading and stylistic approaches to jazz drumming. Clinician Biographical Information Rodrigo Villanueva Drummer and composer holding a bachelor’s and a Master’s degree in Jazz Studies from the University of North Texas, he has played and/or recorded with jazz, classical and pop artists from around the globe: Stefan Karlsson, Lynn Seaton, Eddie Gomez, Fareed Haque, Ed Saindon, Takayoshi Yoshioka, Jon Anderson, Carlos Prieto, Roberto Limón and Mike DelFerro. As a composer he has published several original compositions for jazz big band. As an educator he has taught drum-set courses, clinics and workshops at many institutions worldwide. He is currently an associate professor of jazz studies at Northern Illinois University, where he teaches jazz drums, jazz arranging and coaches the NIU Jazz Lab Band. Rodrigo performs regularly with his jazz trio/quartet, the Eddie Gomez Trio, the NIU Faculty Combo, and Panoramic. He endorses Sabian Cymbals, Yamaha Drums, LP Percussion, Evans Drum Heads, Vic Firth Drum Sticks and Reunion Blues Cases.